It's a bit of a misnomer, as "autoloading" shotguns don't actually load themselves. They reload themselves. Most autoloaders have a tubular magazine that will hold three or more shells. Combined with a shell in the chamber, this means quite a lot of firepower. 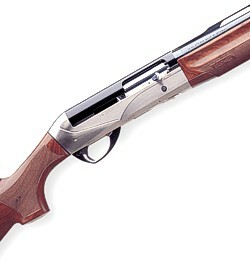 Autoloading shotguns are either gas operated or recoil (inertia) operated. In gas operation, a port in the barrel allows some of the rapidly expanding gasses from the shell's firing to escape and operate a piston that operates the automatic loading action. In an inertia/recoil system, the force of shell being fired drives the action. Recoil operation, in a well-made shotgun, is ultimately more reliable than gas operation, but can feel a little more sharp to the shoulder. If a repeating gun is the right tool for the job, but the shooter has any worries at all about the reliability of an autoloader (or the price feels a little steep), a pump-action gun is a solid choice, if not always as elegant.